Categories: Concise Advice Series, Self Development, Self-help. As our lives get busier, boundaries between work and leisure blur and we spend less time thinking about what we’re putting out minds, bodies, and souls through. This fast-living is resulting in a pandemic of ‘ill-being’: from general weariness and ‘feeling under the weather’, to prolonged bouts of sickness, lethargy and sharp increases in stress, depression, and mental health issues. The Wellbeing Book will demonstrate how we can interact with the world to lead a better life. 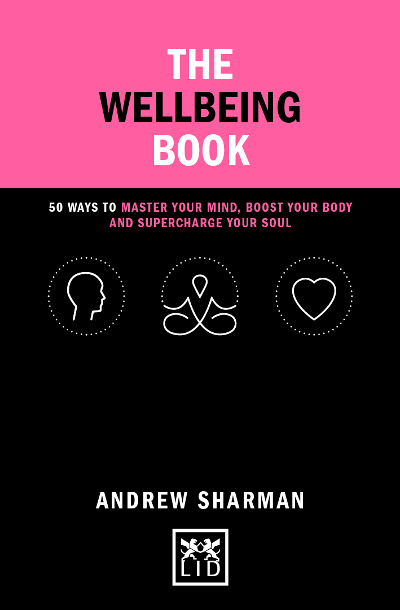 The author provides 50 practical and uplifting ways to improve physical and mental wellbeing by focusing on the mind, body, and soul. In doing so, he helps us to hit the pause button and learn how to enhance our energy and build resilience, cultivate our emotional and physical wellbeing, manage stress and live a happier and more fulfilled life. ● 50 practical ways to boost the wellbeing of our minds, bodies and souls. ● Each activity takes less than five minutes to complete and provides a rich source of fast-acting relief, fun and vitality. ● Discover, explore and understand how to live a happier and more fulfilling life. Andrew Sharman is the Founder and Chief Executive of RMS, global consultants on health, work, and wellbeing to Fortune 500 corporations including Apple, Burberry, Mercedes Benz, and many more. He’s an in-demand EQ practitioner and personal coach to leaders around the globe, a TED speaker, and professor of leadership and culture at one of the world’s top business schools.